It’s been awhile, ne? Ah, this story hasn’t gotten any less frustrating. There is no forward progress for anyone…and there’s only two episodes left in the series. Although, the previews for episode 8 show that hell might be about to break loose. Daddy and Hitoshi have declared war on each other officially. Kazu is quick to figure out when Hitoshi arrives on Rei’s doorstep that his wife and his eldest son had an affair. Kazu lets Hitoshi into the apartment and tells Hitoshi that he and Rei are working things out. Hitoshi glances at Rei. Is this true? No. Rei refuses to go back and to try to keep the peace between father and son she lies. She says that she realized how low she was and was looking for someone to rescue her. If Hitoshi hadn’t shown up when he did, she would have run off with some other guy. She has no learned that love has nothing to do with being saved. She will stand on her own feet alone. Hitoshi tries to get Rei to stop, but she won’t. This aggravates Kazu even more—how dare they show such a united front, each trying to protect the other? Truthfully…I don’t think Rei is 100% lying. She was all alone. Kazu came into her life and really did (until they got married) cherish her and treated her well. So…it wasn’t love, but a desperate desire to escape loneliness that led her to marry him and he was at that time a very good man to her. This all changed after marriage as he began to emotionally abuse her, neglect her, and belittle her. She was, of course, blatantly lying when she said she would have jumped any man’s bones. You know she was trying to protect the relationship between father and son. Rei tells the men to leave by the time she gets back. Kazu and Hitoshi bicker about her and Muraki. Before Kazu leaves he looks at Hitoshi and basically disowns him. Nice. After his dad leaves, Hitoshi runs around looking for Rei. When he doesn’t find her, he heads back to her apartment and knocks on the door. By this time Rei has returned. She refuses to answer the door and tells him to go away as she doesn’t have money to move. Hitoshi loves her and can’t give her up. Rei asserts she doesn’t love him, was only using him, and is a selfish person. It doesn’t matter if Rei really is selfish as Hitoshi vows to love her anyways. Plus…we all know that if Rei was really selfish, she would have stayed in the house to reap the benefits of Kazu’s wealth and privilege (while carrying on something on the side). Now that the secret is out in the open, Kazu moves quicker and harder to destroy Muraki while Hitoshi and company do their best to salvage the disaster. I have to say, while I don’t think Muraki’s reform is bad, I’m really wondering if he’s really all that honest and squeaky clean. It could be because I don’t trust any politician as many say one thing and turn around and do another, but I find Muraki suspicious. In this episode when he’s hiding out at Hitoshi’s and drinking with Hitoshi and his friend, he seemed fake. He honestly can’t remember ever advising a supporter of his to evade taxes by doing anything. Plus…he also supports Hitoshi’s newspaper friend’s more underhanded methods. Just because the opposition is using such methods, doesn’t mean they need to. Even if Hitoshi believes in what Muraki’s preaching, I think he should use a little more caution. 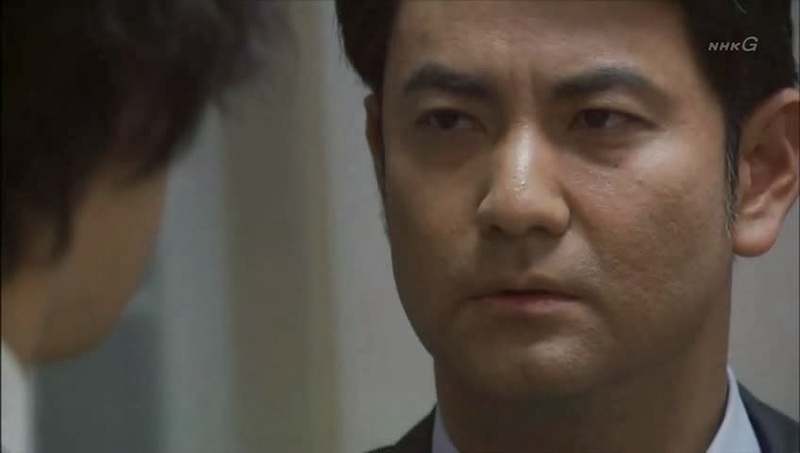 While Hitoshi is harboring his father’s enemy, Kazu visits Rei saying he has signed the divorce papers. Rei opens the door only to have Kazu shove a very full envelope in her face. That doesn’t look like divorce papers. Nope. It’s consolation money. Don’t be mistaken, it’s not about the dissolution of Rei’s and Kazu’s marriage, it’s about the dissolution of Rei’s and Hitoshi’s relationship. Rei insists that she has no intention of carrying on with Hitoshi at all. That’s good because as much as Rei is beneath him, she’s even further beneath Hitoshi. Eyeroll. 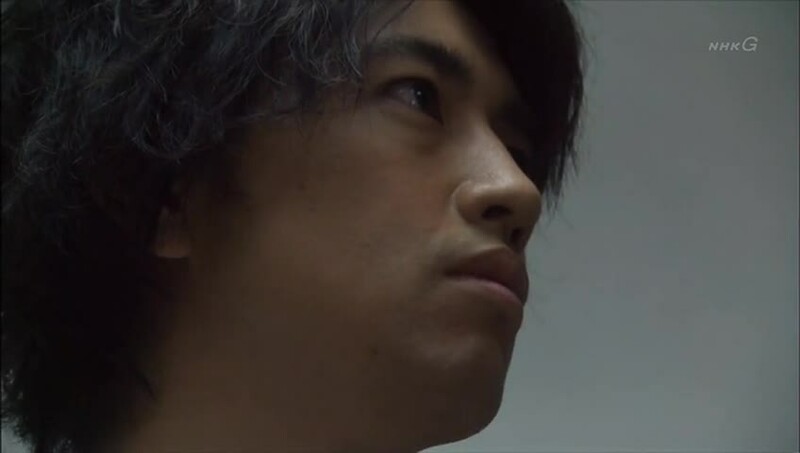 Kazu does warn of what will happen if the bureaucratic agency finds out. There will be hell to pay and Hitoshi’s life and career will be officially ruined. Rei asks if Kazu is doing this to insult her. He thinks a little bit. Yes. There is a part of him doing this just to make her feel as low as possible. That answer earns him a door slammed in his face. He deserved it. Smarting from this, Kazu goes home and calls up Onaka. She doesn’t recognize the number, but answers it anyway. Silence. Kazu hangs up and Onaka realizes he was finally calling. This makes her day. She calls him back pretending not to know it’s him. Kazu says who he is and Onaka talks about how she has joined Muraki’s party and how Hitoshi is there all the time—didn’t Hitoshi tell Kazu this? Nope. Onaka then says that the men she supports always do well. Tough luck isn’t that Kazu has coldly cast her aside now, huh? I must admit to be slightly shocked that she dealt such a low blow to Kazu…but then again…their relationship was really ambiguous. I couldn’t 100% tell if the deepness of the relationship was mostly in Onaka’s head or not. Nanami brings pudding to Kenji who is acting like a dutiful housewife until his exam scores are released. Nanami talks about letting go of all her emotions in regards to Jikkun, etc. She then complains about Kenji being too passive and stupid to understand everything. Kazu comes home and congratulates Nanami on her story, but I don’t think he honestly means it since she is basically writing the truth about his family disguised as fiction. Nanami then reveals she will be coming over often as she and Kenji are officially a couple. Did I miss that? I never knew it was official. Kazu is quick to say he’s against this. Nanami then says her attraction to Jikkun really was only skin deep. She liked his face. With Kenji, she fell in love with his good heart. When Nanami goes on and on about Jikkun and Rei, Kenji tries to get her to shut up and Kazu reiterates that he’s really against Kenji dating Nanami. LOL. SERIOUSLY! What was that girl thinking? Kazu goes upstairs and gets to overhear Kenji scolding her for her big mouth and not leaving well enough alone. Kazu’s next move against Muraki is a very nasty article in a major newspaper. Hitoshi confronts Morita about this, but Morita says there was nothing he can do to quash it. The problem is Kazu is too well connected and too powerful for them to counter. This really angers Hitoshi. WHY are they so powerless when they are trying to better the country? Meanwhile, the PM is happy to hear about Muraki’s new problems. Kazu doesn’t take the credit—false modesty? But he does give the PM advice on what to do to ensure that Muraki doesn’t bounce back after the rumors and negativity die down. Will the PM follow the advice? Will Kazu’s actions bite him in the rear later? Rei’s job takes her back to the town she left. To Onaka’s gym of all places. Onaka happily greets her and scolds Rei for not letting her know she needed a job as Onaka could have gotten her a more glamorous one. Rei quickly says she loves her job and goes to leave only to run into Hitoshi who is at the gym looking for Muraki. The two stop and stare at each other for a long time. Rei’s expression belies what she told Hitoshi earlier—you can tell she misses him and cares for him a great deal. She then runs away and Hitoshi runs after her. This is all witnessed by Onaka who realizes just what must have happened. Outside of the gym, Hitoshi calls out Rei’s name. She stops and turns. Is she doing all right? Rei says that she is. After more long glances, she finally turns and heads off while Hitoshi can only stare morosely after the truck. Nanami has seen all of this and is shocked. She calls out to him…isn’t he happy now? Nope. Hitoshi won’t be happy until he has the strength to protect both Rei and Muraki. I don’t think Kazu is 100% a bad guy. He’s human. His love took on a very possessive streak which helped break down the relationship. Sure, he might have sensed the tension between Rei and Hitoshi and what it could lead to and that is why he came down so hard…but he should have realized that doing that would only hurt both his son and wife and it helped increase the likelihood of something occurring. I don’t agree with his underhanded and aggressive tactics against his political opponent, but I also don’t think Muraki is all he’s cracked up to be. I could be wrong. In spite of everything, even if he tells Hitoshi that the boy isn’t his son anymore…he does still try to protect him to a point. Of course, Hitoshi can’t see this and only thinks the war is really on. At this point in the drama, the political aspects are such a secondary story that it seems nearly superfluous, even though it could have been interesting even more so to learn a bit more about politics and reform.